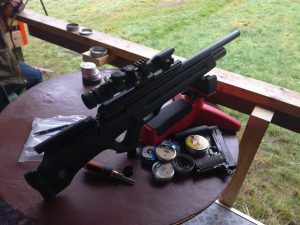 It can be quite daunting purchasing a rifle and this section of the website is dedicated to club members talking about their rifles, why the chose the specific model and how the rifle performs on the range. Can they get a grouping at 50 yards? Does it kick like a mule? Club and Committee member Leighton owns a .22 FX Bobcat here he talks about why he chose the Bobcat. I’ve been shooting for almost twenty years from a very young age and recently moved to Scotland from South Wales. I’ve always owned full-length air rifles and usually shoot with a bipod and a very large scope for some long range plinking. I never considered taking part in any competitions until I joined Westfield and the idea of competing became a possibility…..albeit after a lot more practice. Unfortunately, the majority of rifles that I owned were too heavy for HFT. Trying to get crosshairs on a target 55 yards away while standing was incredibly difficult and requires arms of steel! 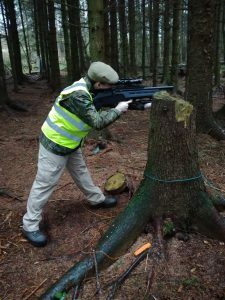 When I started to investigate competitive HFT I also learnt that many of the features of my big scopes, bipod and custom stocks were not permitted in competitions – I certainly had a lot to learn. I started asking the club members what rifle they would recommend and the Bobcat came up several times…..well more like several dozen times. The rifle was popular amongst the members and after a bit of saving I ordered my own.